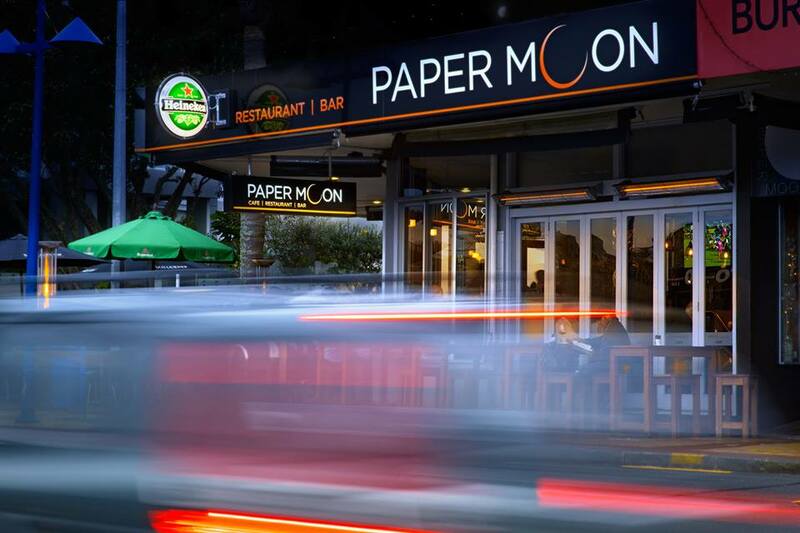 Paper Moon is undisputedly Mairangi Bay’s favourite dining and drinking spot. Be it for breakfast, lunch, dinner, or drinks into the evening, we’re the place that pleases. It’s our passion to create the perfect occasion. Everyone loves a Happy Hour and ours is every day, from 3-6pm. So it’s actually a Happy Three Hours. (We’re good like that!) Bringing you house wines for $5.90, and beers for $6.90 makes us happy too! Feel special with a cocktail special on Wednesday nights - they’re only $10. Our coffee is Allpress. Enough said. Except to say that our staff are actually trained on site and off by Allpress as well. We aim to please our many four-legged friends too here - water bowls outside ensure its not only the humans who enjoy some refreshment. Our staff love dogs, so you can be sure they’ll be doted on and shown lots of love! This is all good, we know, but don’t take our word for it! 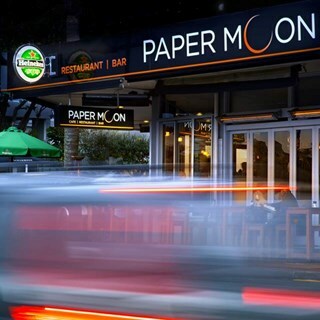 Come and raise a glass with us soon at Paper Moon. Staff very friendly and accommodating. No request too much for them. Most people enjoyed their food very much. Felt a bit locked in, in the back room... was a bit hot. Menu was great, service very good. Please get light wines in. I ask for a light sav every time but. Most places have them! Jasmine was an awesome waitress. Very friendly and cheerful. She made us feel very welcome. Everyone enjoyed their meals at our table of four. I loved the Beef Wellington and the Chocolate Bomb dessert. Nicely presented food and great service. Waitress didn't return to table after serving desserts, to check whether we wanted anything else. Also, only provided one bottle of water for four of us for the evening, and we couldn't attract attention of waitresses to ask for more. Asked for vegan but order was sent to kitchen wrong. Then when the corrected order was finally delivered cutlery was not provided. Had a very enjoyable meal, well presented, and tasty flavour combinations. Generous portions, had to share dessert! Friendly service. Definitely recommend. Had visited The Engine Room earlier in the week and was very disappointed. Found Paper Moon far superior! Will definitely be back. The back room is a bit of a disaster - dark and rather miserable. Steak dinner was a really good price, salad OK, chips good, garlic bread poor but overall it just didn'r really make us want to come back. Loved the $10 burger and bottle. Yummy food and friendly staff - a great place to catch up with firends. Great place to take anyone:) Don't change. Best steak we have had and we eat out a lot. And the chocolate bomb is absolutely delicious. Great dinner but very quiet for a Saturday night. Lots of local competition taking its toll? Excellent food and service. We will be bak. Very friendly staff and comfortable space for a dinner with my wife, we enjoyed the special steak with delicious fish meal in a wonderful Sunday night. After dining many notable restaurants over the years, I commend Paper Moon - Mairangi Bay for the manner in which they present themselves the menu and the environment. I will become a regular for sure. Great café/restaurant, close to lovely beach.